Where can you find cold steins of beer, dirndl clad dainties and pair of lederhosen in October? In Happy Valley of course - our Oktoberfest celebrations are famously the best in town! You can find the fastest horses and the best jockeys too - now that is a combination that's hard to beat! Autumn is upon us and the days and nights are getting cooler and Sep 26 and Oct 3 & 10, is the perfect time of year to quaff a cool Paulaner beer and watch the winners sweep towards the finish line from The Gallery’s amazing view of the home straight! To accompany the fine brew, The Gallery is serving up some classic German cuisine to tempt your tastebuds and satisfy your stomach. Brew up your competitive spirit with a game of Beer Pong and answer one racing-related question to win a free glass of Paulaner beer1. Who doesn’t think princess when they see a classic Bavarian castle? Bring your best girlfriends to The Gallery on Oct 10 for our special Pink Event, an evening of Teutonic-themed fun! To make the night really hop, racing host Scarlett Cheung will join race goers to lead games and share racing strategy tips. Be the toast of the town and dress in blue, yellow or white to enter our best dressed contest, the winner will receive an $800 food and beverage certificate and a glass of Paulaner beer for everyone at your table! Photo corners will ensure you snap your best friends from the most flattering angle so you can share your night of fun and frolic! Are you an expert in lager but aren’t sure how to wager? Does the quinella leave you quivering? Don’t worry, our racing specialists are here to perfect your wagering skills! You’ll find Racing 1012 located in The Gallery, and you will receive a Pink Event Mini Plush upon participation in racing. Make your reservation online at www.bookingrc.hkjc.com to get the night started in the best German fashion! Book now and don’t be late! 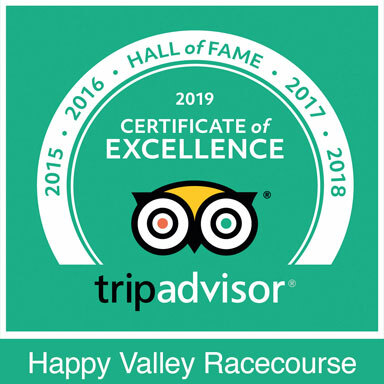 ² Racing 101 is available every Happy Valley race night. Each participant in this 50-minute programme receives a horse plush upon participation in racing. 3In case of any disputes, the decision of The Hong Kong Jockey Club shall be final.